© 2014 by Holly Black. Originally published in MONSTROUS AFFECTIONS, edited by Kelly Link and Gavin J. Grant. Reprinted by permission of the author and Candlewick Press. 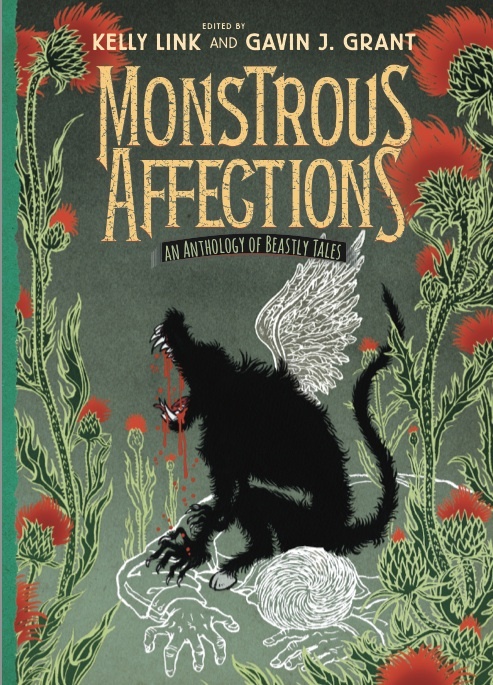 This story also appears in the new anthology MONSTROUS AFFECTIONS: An Anthology of Beastly Tales, edited by Kelly Link & Gavin J. Grant. Available now from Candlewick Press. That’s what your uncle tells you, after he finds you stowing away in his transport ship, the Celeris, which you used to call the Celery when you were growing up, back when you only dreamed of getting off the crappy planet your parents brought you to as a baby. No matter how many times you told them their dumb dream of being homesteaders and digging in the red dirt wasn’t yours, no matter how many times you begged your uncle to take you with him, even though your parents swore that he was a smuggler and bad news besides, it wasn’t until you climbed out of your hidey-hole with the vastness of space in the transparent alumina windows behind you that anyone really believed you’d meant any of it. Once you’re caught, he gives you a long lecture about how there are laws and there’s right and wrong, but those aren’t rules. And, he says, there are especially no rules for situations like this. Which turns out to be to your advantage, because he’s pissed but not that pissed. His basic philosophy is to laugh in the face of danger and also in the face of annoyance. And since he thinks his brother is a bit of a damp rag and likes the idea of being a hero to his niece, it turns out that no rules means not turning around and dumping you back on Mars. He also turns out to be a smuggler. Grudgingly, you have to admit that your parents might not be wrong about everything. Your uncle tells you this several times as you dock in the Zvezda-9 Spaceport, but it’s not like you don’t know it already. Your parents have told you a million stories about how alien races like the spidery and psychopathic Charkazaks—fugitives after their world was destroyed by InterPlanetary forces—take girls like you hostage and force you to do things so bad, they won’t even describe them. From all your parents’ warnings about spaceports, when you step off of Celeris, you expect a dozen shady aliens to jump out of the shadows, offering you morality-disrupting powders, fear inhibitors, and nucleus accumbens stimulators. Except it turns out that spaceports aren’t that interesting. Zvezda-9 is a big stretch of cement tunnels, vast microgravity farms, hotel pods, and general stores with overpriced food that’s either dehydrated or in a tube. There are also InterPlanetary offices, where greasy-looking people from a variety of worlds wait in long lines for licenses. They all stare at your homespun clothes. You want to grab your uncle’s hand, but you already feel like enough of a backworld yokel, so you curl your fingers into a fist instead. You do not, however, see a single Charkazak. No one offers you any drugs. “Stop acting stupid,” your uncle growls, and you try to act less stupid and keep from staring. You try to act like you stroll around spaceports all the time, like you know how to use the gun you swiped from your mother and strapped to your thigh under your skirt, like the tough expression you plaster on your face actually makes you tough. You try to roll your hips and swagger, like you’re a grown lady, but not too much of a lady. Your uncle laughs at you, but it’s a good kind of laughter, like at least you’re sort of maybe pulling it off. Later that night, he buys you some kind of vat-meat tacos, and he and some of his human “transporter” buddies get to drinking and telling stories. They tell you about run-ins with space pirates and times when the InterPlanetary Centurions stopped their ships, looking for illicit cargo. Your uncle has a million stories about narrow getaways and hidey-holes, in addition to a large cast of seedy accomplices able to forge passable paperwork, but who apparently excel at getting him into dangerous yet hilarious situations. You laugh your way into the night. The next day your uncle buys you a pair of black pants and a shirt like his, made from a self-cleaning material that’s both hydrophobic and insulating, plus a shiny chromium steel clip for your hair. You can’t stop smiling. And although you don’t say it out loud to him, in that moment you’re sure that the two of you are going to be the greatest smuggling duo of all time. 3. When someone says they’ll pay double your normal rate, they’re offering to pay at least half what you’d charge them if you knew the whole story. The Celeris stays docked in the spaceport for a couple of weeks while your uncle buys some used parts to repair the worst of wear and tear to her systems and looks for the right official job—and then an unofficial job to make the most of that InterPlanetary transport license. You try to keep out of your uncle’s way so he doesn’t start thinking of you as some kid who’s always underfoot. You don’t want to get sent back home. Instead, you hang around the spaceport, trying to make yourself less ignorant. You go into the store that sells navigational charts and stare at the shifting patterns of stars. You go into the pawnshop and look at the fancy laser pistols and the odd alien gadgets, until the guy behind the counter gets tired of your face and orders you to buy something or get out. After a while the spaceport seems less scary. Some of your uncle’s friends pay you pocket money to run errands, money that you use to buy caff bars and extra batteries for your mother’s gun and holographic hoop earrings that you think make you look like a pirate. Just when you start to feel a little bit cocky and comfortable, your uncle informs you that it’s time to leave. He’s lined up the jobs. He’s found a client. A little man with a red face and red hair sits in their eating area on the ship, sipping archer ethanol, booze culled from the Sagittarius B2 cloud, out of a coffee can. The man tells your uncle that he supplies alien tissue to a scientist who has his laboratory on one of the outer worlds, where the rules about gene splicing and cloning are more lax. The little man has come across a particularly valuable shipment of frozen alien corpses and needs for it to get where it’s going fast, with few questions asked. The assignment creeps you out, but you can tell that your uncle has been distracted by the ludicrously high offer the man is waving around. It’s more money than you’ve ever imagined being paid for anything, and even with the cost of fuel and bribing Centurions, you’re pretty sure there would be enough to refit the Celeris in style. No more used parts, no more stopgap repairs. He could have all new everything. The red-haired man doesn’t seem all that impressed. You have lots of questions about where the alien bodies came from and what exactly the scientist is going to do with them, but a quick glance from your uncle confirms that you’re supposed to swallow those and keep pouring drinks. You have your guesses, though—you’ve heard stories about space pirates with alien parts grafted on instead of their own. New ears and eyes, new second stomachs tough enough to digest acid, second livers and new teeth and organs humans don’t even have—like poison glands or hidden quills. And then there were worse stories: ones about cloned hybrids, pitiless and monstrous enough to fight the surviving Charkazak and win. But you’re a stupid kid from a backworld planet and you know it, so you quash your curiosity. After the client leaves, you clean up some and fold your stuff so it tucks away in the netting over your bunk back in your room. You go down to the cargo hold and move around boxes, so the way to the secret storage compartment is clear for when the redhead comes back with his alien parts in the morning. That night you look out through the transparent alumina windows at ships docking on Zvezda-9, and you get excited about leaving for your first mission in the morning. But in the morning, the Celeris doesn’t depart. It turns out that it takes time to get ready for a run like this—it takes supplies and paperwork; it takes charting a course and new fuel and lots of batteries and a ton of water. The whole while you careen between sadness over leaving Zvezda-9 now that you’ve become familiar with it and wishing you were in space already. You visit your favorite spots mournfully, unsure if you’ll ever see them again, and you pace the halls of the Celeris at night until your uncle orders you to your bunk. His temper is a short-sparking fuse. He sends you to buy supplies and then complains loudly about what you get, even though you’re the one who’ll be doing the reheating and reconstituting. The client arrives in the middle of the night. You sit in the shadows above the cargo bay and watch what he loads—a long cylindrical casket, big enough for several human-size bodies. Smoke curls off of it when it’s jostled, as though it is very, very cold inside. An hour later you’re back among the stars. There, your uncle starts to relax, as though space is his real home and being on a planet for too long was what was making him tense. Over the next week, he teaches you a few simple repairs he has to do regularly for the Celeris, shows you a few of his favorite smuggling hidey-holes, teaches you a card game and then how to cheat at that card game, and even lets you fly the ship for an hour with him hanging over your shoulder, nagging you about everything you’re doing wrong. Considering that he turns on autopilot while he sleeps, letting you put your hands on the controls while he watches isn’t that big of a vote of confidence, but sitting in the cockpit, gazing out at the spray of stars, makes you feel important and wholly yourself, as though all your time laboring in that red dirt was worth something, because it brought you to this. Mostly the trip is uneventful, except for an evening when your uncle comes up from the cargo hold and won’t look at you. He downs a whole bottle of archer ethanol and then gets noisily sick while you watch the computer navigate and fiddle with your earrings. He never says what set him off, but the next day he’s himself again and you both try to pretend that it never happened. Then you wake up because the whole ship is shaking. At first you think you’re passing through an asteroid field, but then you realize something bad is happening. There’s the faint smell of fire and the sound of the ship venting it. Then the gravity starts going crazy—lurching on and off, bouncing you against the floor and the walls. Once it stabilizes, you manage to crawl out into the corridor. Your heart is pounding like crazy, fear making you light-headed. You clutch your mother’s gun to you like it’s some kind of teddy bear. There’s shouting—more voices than there should be on board. You think you hear your uncle calling your name and then something else. Something loud and anguished and final. You head automatically for the cockpit when a man runs into the corridor, skidding to a stop at the sight of you. Based on the mismatched array of weapons and armor, you figure he’s got to be a pirate—if he was a Centurion, he’d be in uniform. He reaches for his weapon, like he’s just shaking off the shock of seeing a kid in her nightgown aboard a smuggling ship, but you’ve already swung your mother’s gun up. You blast him in the head before you allow yourself to consider what you’re doing. When he drops, you start trembling all over. You think you’re going to throw up, but you can hear more of them coming, so you try to concentrate on moving through the ship, on remembering all the hidey-holes your uncle pointed out to you. The lights go out all of a sudden, so you have to feel your way in the dark, but soon you’ve found one big enough for you to fit yourself into and you’re shut up inside. Snug as a bug in a rug, your mom would say. You start crying, thinking about her. You know your uncle is probably dead, but you don’t want to admit that to yourself yet, so you pretend you’re not thinking of him when you wipe away your tears. 4. If your ship gets raided by space pirates, don’t hide in the cargo hold, because everybody wants what’s in the cargo hold. The Celeris is a small enough ship that you can hear the pirates walking through it, talking to one another. You try to count different voices, but all you can figure out is that there’s more than five and probably less than ten. Which doesn’t mean that much, since they boarded from another ship and there could be any number of them back there. Did you find it? you hear them say, over and over again. We’ve got to find it before it finds us. Which doesn’t mean anything to you. You wonder if they attacked the wrong ship. You wonder if your uncle got murdered for nothing, for less than nothing, since the credits he got paid are in his bank account and not anywhere aboard the ship. You hear the acceleration of the engines and feel the odd sensation of forward momentum. Which means they’re probably taking the whole ship, not just gutting it for parts and leaving it to spin endlessly in the void—which would have meant no life support for you. Maybe you’ll survive this, you think. Maybe no one even knew you were aboard, maybe they thought the guy you shot was shot by your uncle. If they docked on a planet, even a terrible planet, maybe you could sneak off the ship and hide in the station. To do that, you need to make sure you stay hydrated. You’ll need food too, but not right away. A bathroom, ideally. You and your uncle usually ate in the little kitchen area—he called it the galley—off the main cockpit, where there’s a small burner, lots of packages of freeze-dried food, tubes of paste, and a jar of nutrient powder. You’re sure that some of the pirates have raided it by now, drinking through your uncle’s supply of archer ethanol—you’ve heard them, rowdy and full of good cheer, like they’d done something heroic instead of something awful. If they catch you, they’ll most likely kill you. You’re using up oxygen, just breathing. But you know all the other things pirates might do instead—sell you, use you, cook you, eat you. Your parents loved to tell you how bad things could get when you talked about wanting to have adventures in space. There’s food in the cargo hold, you know—those were the supplies that went on the official roster as his official shipment. Your uncle had the papers to sell that stuff to a homesteader planet. He’d been planning on sending you down to haggle with them—and had loaded you down with plenty of pieces of dubious bargaining wisdom in preparation. Don’t be afraid of silence, he’d told you. Silence shows your strength. Have a bottom line, he’d told you. Sometimes to make a deal, you’ve got to walk away from a deal. But it turned out that pirates didn’t care about negotiating. Just like your uncle had told you in the beginning, there aren’t any rules. You doze impatiently waiting for your chance to slip down to the cargo hold. Your leg cramps from the position you’ve folded yourself into, and finally you decide that even though you can still hear voices, they’re faint, and you’re going to have to go for it. You unfold yourself and step into the hallway. The floor is cold against your feet, and you feel light-headed from being in one position so long, but you begin to pad your way toward the cargo bay. There’s a steel ladder to a crow’s nest above the cargo bay, and as you climb down it, you know that if there’s a pirate patrolling beneath you, he’s going to see you before you see him, your pale nightgown fluttering around you like a white flag of surrender. There’s nothing you can do about it, though, so you just try to keep on going and stay quiet. You’re in luck. There’s no one there. You climb all the way down and start to open up the shipping crates. You find luxuries that settlers love—caff bars, tins of coffee, jars of spicy peppers, fermented soy, and plenty of both salt and sugar. Ripping into one of the caff bars, you realize the stuff won’t keep you fed until the pirates dock, unless they dock very soon. Worse, there’s nothing to drink. Despairing, you grab another caff bar and begin to look over the few remaining crates. You find some machinery—farming stuff—and what appears to be an array of tents suitable for a desert environment. You’re freaking out, sure that you’re about to be caught, when you remember the secret hold, where the alien bodies are being stored. There might not be anything particularly useful there, but it’s at least a little more spacious than your last hiding place, and if you keep to the corners, you’ll have a great shot at picking off any pirates who discover the compartment before they can spot you. It takes you a few tries to get the hatch open, but you manage it and slide down into the darkness. The only lights are the dim blinking green and blue and red buttons on the side of the cylindrical casket. You crawl over to it and look at the buttons. Maybe, you think, maybe it has life support built into it. Maybe you could dump out the contents and put yourself inside if things got really bad. You squint at the control panel. There’s a large button, clearly labeled: VIEW SCREEN. 5. If your ship gets raided by space pirates and you wind up hiding in the cargo hold, even though you know it’s a bad idea, don’t go poking through the secret cargo. A square of the shiny white case turns clear and the inside glows. The whole thing hums a little, as though expecting more instructions, a thin mechanical whine. You lean down, looking at what’s inside, and then it’s all you can do not to scream. There’s a Charkazak, its eight terrible black legs drawn up against the shiny black carapace of its chest. Its humanoid face, with black lips and red tattoos along its cheekbones. A chest that rises and falls with breath. You stumble back, falling against the steel, more scared than you were when you faced down the pirate in the hallway, more scared than when you felt the blast hit the side of the ship and realized the Celeris was being raided. You’ve heard horror stories about the Charkazaks all your life, on the news, whispered about at slumber parties of kids on the farm, and even on Zvezda-9. They were a race of warriors who worshipped death, becoming bodyguards for the most corrupt merchants and glorying in being soldiers on the front lines of the most awful wars just so they’d have more opportunities for bloodshed. They were so awful that they wouldn’t follow InterPlanetary laws regarding who it was okay to kill and who it wasn’t, nor did they believe in things like surrender or mercy. They invaded planets, brought down ships, and generally behaved like the monsters they appeared to be. When Centurions were dispatched to discipline the Charkazaks, they fought back with such viciousness that the only way to keep them from overrunning the galaxy was the obliteration of their planet and all the Charkazaks on it. Those that were off-planet when the Charkazaks homeworld was destroyed became even more vicious than before. And as you look at the living one cocooned in metal, you feel like a child hearing those stories for the first time—more like a child than you’ve felt since you stowed away after that last stupid fight with your parents. This—this must have been what the pirates meant when they worried about it finding them before they found it. You wonder how the redheaded dirtbag who hired your uncle acquired such a thing and where you’d really been transporting it. That Charkazak is the reason your uncle is dead. The whine gets a little louder, and one of the red buttons on the side of the case begins to blink, like a throbbing pulse. Between that and the dim light from the screen, the secret cargo area feels too bright, but you wait and wait and finally all the lights switch themselves off. You wouldn’t think you could sleep with that thing near you, but you’re so relieved to be able to stretch out your limbs that you sleep after all. You dream of someone calling your name from very far away. When you wake, your body is stiff with cold and everything is still dark. You realize that you’re freezing and that if you don’t get warmed up fast, you might be in serious trouble. Tents, you remember. There are tents up in the regular cargo hold. But as you feel around in the dark, you can’t quite make out how to open up the hatch. Then you remember that the casket lit up—surely that would be enough for you to find the latch by—so you go over and press the green button again. It lights up the case and you try not to look inside. You scuttle up instead and grab a couple of tents. You’re dragging them back down when you hear the tramping of heavy footfalls. They speed up, like maybe they heard the thud of the material hitting the floor, and you swear under your breath. You move as quickly and quietly as you can, back under the floor, yanking the cover of the hidden compartment into place. The light is still shining from the casket, and you’re afraid that the glow will show through the seams and reveal your hiding spot. You press the green button again, hoping that will turn off the view screen, but it doesn’t. The other light—the red one—starts blinking again, and you’re panicking, because it’s brighter and more obvious than the glow from the casket. Push to open, the red button says. And as the footfalls come closer, as you hear the pirate feel around for the latch, a sudden strange calm comes over you. Since you’re going to die—or worse—you figure, screw everything. Screw the pirates, screw yourself, screw every goddamn thing. You owe your uncle some final revenge. You’re not going out like some dumb farmer kid. You’re going to give those pirates exactly what they were looking for. So you press the button. Twice. There is a horrible loud sound, like a giant exhalation of breath. The top of the casket slides open. 6. And if you do go ahead and poke through the secret cargo, then for the love of all that is holy, watch out which buttons you push. For a moment, you almost believe that you can take back the last five minutes. It seems so impossible that you could have done what you did. You were tired and freaked out, but you’d been pretty clever right up until then, clever and quiet and careful. Not crazy. No death wish. For a moment, you’re just angry, so angry—at yourself, at the world. It feels so unfair that you’re going to die because of one stupid decision, one bad moment. You snort, because it’s a ridiculous thing to say. What does that mean—go easy on you—like surely he knows that implies nothing easy at all? Plus, it’s too late. He’s swaggering around, cocky, without realizing that you’re both about to be dead. You’re all about to be dead. “Come out, come out, wherever you are,” he calls, a laugh in his voice. From the casket the Charkazak unfolds itself, bathed in the glow of the light from within. It rises, up and up and up. Eight legs, two sets of arms with six-jointed fingers on its shining onyx chest, and large luminous eyes. It might have human features, but you can’t read its expression. It seems to shudder all over, then swings its head your way. Fear makes you nearly pee your pants. You freeze so completely that you don’t even draw in breath. It moves toward you—fast, its legs a blur—and leans down, all wide eyes and flaring nose slits. Your mother’s gun is lying beside you, but you don’t grab for it. You released the Charkazak, after all. There’s no point fighting it. You close your eyes, but you can still hear the scratch of Charkazak feet against the floor, can smell the medicinal odor that clings to it from its containment, can hear its ragged breaths. You hear the slide of metal on metal and open your eyes. The Charkazak is no longer in front of you. You let out your breath all at once, so fast that you feel dizzy. “Hey, there, you—” the pirate says, then there’s a gasp and a wet, liquid sound. You sit in the cargo hold for a while—you don’t know for how long—too scared to move. But then you force yourself numbly to your feet. You walk past the body of the pirate, with a massive bloody hole in his chest like that Charkazak thrust a clawed hand into his chest and pulled out his heart. The pirate’s gurgling a little, but his eyes are shut, and you wouldn’t know how to help him, even if you wanted to, which you don’t. You go straight to the galley, passing two more bodies. They are bent at odd angles, one missing the top of her head, her long red-blond hair in a cloud around her face. There is an odd spatter of red along one wall, and laser blasts have blackened the corridor. In the galley, you wash your hands and then make yourself a cup of tea. You eat an entire sleeve of sugar cookies and then you heat up a freeze-dried package of salty, soy-drenched noodle soup and eat that, too. There’s no point in dying on an empty stomach. After that, you feel super sleepy, your eyes heavy, so you go back to your tiny room, climb under the covers, and close your eyes. 7. On a spaceship, there really aren’t that many places to hide. The Charkazak isn’t like the pirates. It’s a monster, and you can’t hide from monsters. So you don’t. But it doesn’t come for you. You go into the bathroom and take a shower. You change your clothes and check your mother’s gun for ammo. Out in the hallway, the bodies are gone. You return to the galley and drink more tea, noting how the food has been picked over. You didn’t count the night before, though, so you’re not sure what was eaten by pirates and what was eaten by the alien. You make some oatmeal with powdery reconstituted milk. While you’re eating, there’s movement in the hallway. You duck down under the table, hoping that you’re not worth the Charkazak’s notice. Maybe you’re like a rat to it, some kind of ship vermin. Maybe you don’t matter. You wrap your arms around your legs and hope you don’t matter. It skitters into the room, and you can’t help noticing that as large as it is, there is a certain gliding elegance to its movements. Then the Charkazak’s body crouches low, bending forward, two pairs of arms reaching to the floor to take its weight. Its head tilts under the table, looking straight at you. “Um, hi,” you say, because you don’t know what else to do. It keeps looking at you, tilting its head the other way this time. Don’t be afraid of silence, your uncle told you, but you are afraid. You don’t have the upper hand in this situation. You don’t have anything to bargain with in trade for your life. 8. You’ll catch more Charkazaks with salt than with sugar. “I know how,” it says after a long moment, and you’re completely startled by its voice, which has a little hiss behind it and an accent you’re not used to but that you understand easily enough. It’s a young voice, a not-much-older-than-you voice, and you have no idea what to make of that. Of course some part of you knew that Charkazaks could talk—or at least understand commands. They couldn’t have betrayed any treaties if they didn’t talk, couldn’t have committed treason if they hadn’t sworn fealty to the InterPlanetary government, but you’re still surprised. Monsters aren’t supposed to sound like everybody else. It—he—leans up and begins to move things on the counter, turning on the water heater and setting out two tin cups. His many legs move, swift as a centipede’s, and equally disturbing. You listen to the crinkle of paper, the whine of the steam, and the sound of water splashing into the cup. Tea making is confusing, because you associate it with comfortably curling up with your holo-reader and sleeping off a minor illness. Monsters aren’t supposed to be able to make tea. If monsters can make tea, then nothing’s safe. “What happened to their ship?” you ask, because he hasn’t killed you so maybe he’ll keep on not killing you. Which meant that everyone who’d once been inside of it was dead. The Charkazak leans down again and passes you a cup with his delicate, multi-jointed fingers. It’s warm in your hands. “Th-thank you,” you manage, and take a sip. Then you start to cough. It’s salty, like your mother described the seas of old earth. “Is there something wrong with it?” the Charkazak asks, folding his limbs under him, so he can look at you. You shake your head, terrified. You force yourself to take another swig and try not to choke. You don’t think you quite pull it off, though, because he looks oddly stricken, studying you with those large, pale eyes. “Was this your parents’ ship?” he asks, taking the cup from you and drinking deeply, as though he’s not afraid of tasting your spit or getting your germs. As though he really, really likes salt. “How do you know the Celeris isn’t mine?” you ask. Then you remember that you’re trying to get him to think of you as some kind of ship vermin, entirely unimportant, and wish you could take back those words. “Is it yours?” he asks, not seeming unwilling to believe it, just confused. You don’t want to tell him that you thought of him as a bullet to the head. Your big murder-suicide plan, now staring at you with that implacable gaze. “I—” you begin, but you can’t think of a lie fast enough. He nods and picks up something from the counter. Then he leaves, the sharpness of his many steps across the floor a reminder of just how fast and lethal the Charkazaks are. Once he’s gone, you draw up your legs, wrap your arms around them, and feel smaller and stupider than ever. You no longer believe that he’ll just kill you outright, but that makes you realize how bleak your future has become. Even if the Charkazak dumps you off at some space station, even if you drain your uncle’s bank account of all his credits, the only place you have to go is home. You didn’t learn enough from your uncle to fly the Celeris yourself. You’ve got no way to make any money back on Zvezda-9. You’re just a farming kid with delusions of grandeur. Of course, you’re not sure that the Charkazak will let you off the ship. He’s from a fugitive race, hunted by InterPlanetary Centurions—he might want to keep you around so he could shove your face in front of any call screens until he moved outside regulated space. Then you’d be in the same situation you were in with the pirates; he could sell you or eat you or . . . well, you’ve heard stories about Charkazaks ripping humans apart in a sexual frenzy, but you’re trying not to think about that. You decide you’re going to make dinner for him. You break out more rehydratable noodles and start in on making a vat-meat goulash. There’s a tube of apple-quince jelly and some cheese that you figure you can either make into a dessert or some kind of first course. Halfway through, you think about cooking for your uncle, and tears come to your eyes. You have to sit down and sob for a little while, but it passes. Once the food’s done, you pad through the halls of the ship to find the Charkazak. A smear of blood still marks one of the walls, wiped by something but not wiped clean. 9. The dead are a lot less trouble than the living. You look for the Charkazak in the cargo area, but you find dead bodies instead. They’re lined up on the floor, the cold keeping them from decaying quickly, but they’re still a mess. Eleven pirates, men and women, scarred and tough-looking, and your uncle, all with their eyes open, staring at a nothing that’s even bigger than space. Your uncle’s shirt is blackened from blaster fire. They must have shot him soon after boarding. You lean down and take out his identification card from his pocket, running your finger over the holo-picture of him, the one where he’s not horribly pale, the one where his lips aren’t blue and his eyes aren’t cloudy. The one where he isn’t dead. You wanted to be just like him—you wanted to have adventures and see the universe. You didn’t want to believe there were rules. See where it got him, your mother would say. See where it got you. On your way out, you can’t help but notice how nine of those eleven pirates died, though. They were sliced open or stabbed through. One was missing a limb as though it had been pulled clean off her. You find the Charkazak in the cockpit, pressing buttons with those long, delicate fingers, his dagger-like feet balanced easily against the floor. He turns toward you swiftly, a blur of gray skin and gleaming black carapace, his body hunched, as if braced for flight. “I made dinner,” you say lamely, heart pounding. He doesn’t immediately respond. You watch as he slowly relaxes and wonder if, for a moment, he’d thought you were stupid enough to attack him. “It’s ready, b-but I could j-just bring you a plate if you’re b-busy.” You’re stammering. You go together through the hall, with you walking in front. You can hear him behind you, can hear the clattering sound of his many feet, and you steel yourself not to look, because you’re afraid that if you do, despite everything, you’ll run. You’ll scream. 10. Good food is universal. And it’s universally true that you’re not going to get any good food in space. In the galley, he manages to perch on the bench while you plate the goulash. He waits, watching. “Tera,” he echoes, and then begins to eat, his long fingers making him seem like a mantis. You are silent, because of course you’re scared. And of course he knows why. You study his strange face—those luminous eyes, the grayish color of his skin, those tattooed marks that remind you of the stripes on a tiger, his high cheekbones, and the sharp elegance of his features, which make him both almost human and very alien. You hear the anger in his voice, but he’s got something to be angry about. He could be lying, but he doesn’t sound like he’s lying. He could be mistaken, but he doesn’t sound like his knowledge is secondhand. “I’m sorry,” you say, because you can’t imagine being hunted across the galaxy, whatever the reason. Reth shakes his head. “No, don’t say that. Because I have become like your legends about my people. I can kill quickly and surely now—and as for where I am taking this ship, I am completing the course that your uncle had set. I am planning on docking and destroying those scientists who would have cut me open and used my body for their experiments. I am going to destroy their laboratory, and I am going to free whatever creatures are being tormented there.” He slams down two of his fists on the table and then seems startled by the action. He looks over at you with haunted, hunted eyes. He was trying to stop you from being scared, and he thinks he’s scared you worse. But he hasn’t really. He’s just startled you. You never heard of any Charkazaks saving anyone, and the anger in his voice is righteous fury, not the desire for bloodshed. He might not sell you to anyone, you realize. Might not rip you apart or eat you. Might not even mean you any harm at all, despite being the scariest thing you’ve ever seen. You force yourself to reach across the table and touch his arm. His skin feels smooth, almost like patent leather. He tenses as your fingers brush up his arm and then goes entirely still. You keep your hand on his arm a moment more, fingers dragging over his skin, and his words gutter out. You wonder when the last time it was that someone touched him—or touched him without anger. You wonder how lonely it’s possible to become out in the void of space. Reth’s eyes narrow and he rises, looming above you on those long black legs. Don’t be afraid of silence, your uncle told you. Silence shows your strength. You know it’s not the nicest thing you’ve ever done, especially because you’re pretty sure Reth’s correct about the Centurions’ likelihood of blowing up the ship rather than fighting him, but you make yourself stay quiet as the seconds tick by. Reth needs you to go to that comm, but you need things from him, too. Promises. “Partners,” he echoes, as though he’s trying out the word, as though he doesn’t know what to do with it. As though you’re giving him something, instead of asking for something from him. Have a bottom line, your uncle told you. Sometimes to make a deal, you’ve got to walk away from a deal. But there isn’t going to be any walking away this time. There was nowhere to walk to, not for either one of you. “Agreed,” he says, and the relief in his voice is enormous. You probably could have asked him for a lot more, and he would have agreed. You’re even worse at this bargaining thing than you thought. “Agreed, Tera,” Reth says softly, like a vow. 11. One more for the road. There really are no rules. There’s laws and there’s right and wrong, but those aren’t rules. You make it up the best you can as you go along. Reth watches you speak, smiling a fierce alien smile as you tell the Centurions to buzz off, swearing up and down that they don’t need to board and you don’t need a tow. Finally, you agree to a small bribe, pull out your uncle’s ID card, and wire the credits over. The whole thing reminds you of one of your uncle’s stories. You hope it would have made him laugh. You hope it would have made him proud. You know you’ve been wrong a lot since you left home, but as you look out at the stars and the Charkazak begins to explain how the controls work, you begin to believe that you might still have a chance to become one-half of the best smuggling duo of all time.